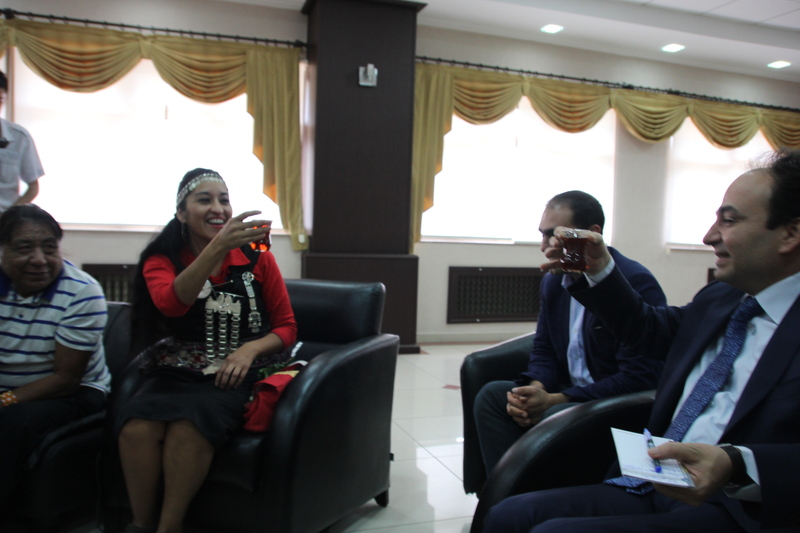 “The struggle of the Mapuche, Hasankeyf and the Indigenous people of the Amazon, is a struggle to preserve the planet” Mapuche leader Moira Millan to Osman Baydemir, Mayor of Diyarbakir. 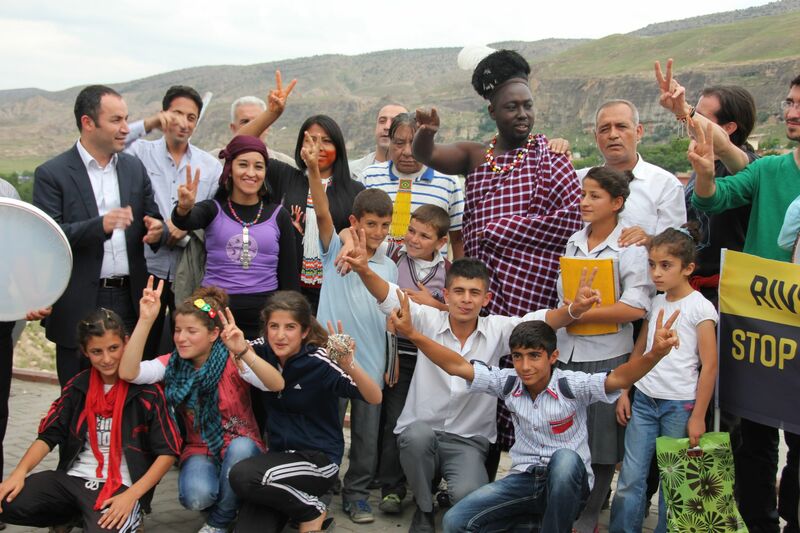 Last week I was in Diyarbakir together with an international delegation coming from as far as the end of the world. 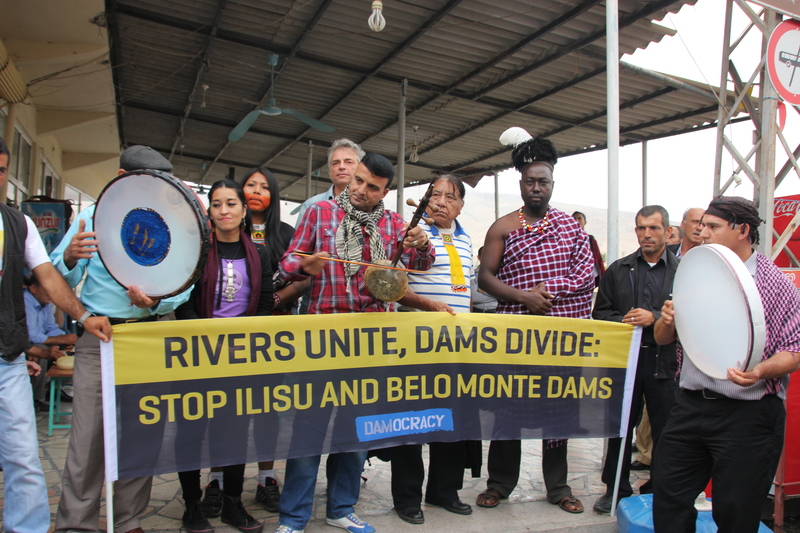 Indigenous leaders from Patagonia’s Mapuche, Amazon’s Kayapos, and Kenya’s Turkana people were part of an international rivers conference in Istanbul organized by Doga Dernegi, a local environmental organization. All of them had one thing in common: they were leaders of indigenous communities threatened by the construction of mega-dam projects and were there to show global solidarity with the people and the struggle against the Ilisu dam. 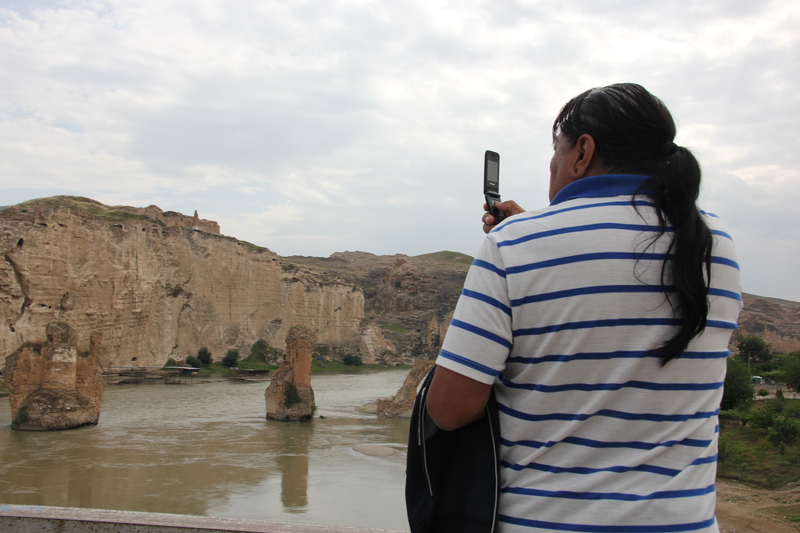 After the conference, the international delegation traveled to Diyarbakir and Hasankeyf to meet its people and politicians and to remind them of their responsibility to protect rivers and be the voice of their people. Mapuche leader Moira Millan told Osman Baydemir, Diyarbakir’s mayor that she had come from the end of the world to defend the Tigris River, “We stand in solidarity against the political and economical threats that are a threat to the continuity of peoples and cultures.” The mapuches have a long history in fighting to defend their land and rivers, Moira added: “To regain our freedom at the expense of the destruction of the planet is not true freedom, is the same logic that has enslaved us. I propose a toss for free rivers” and with a tea glass in hand, we all tossed for the world’s rivers. The mayor received us in a spirit of unity and solidarity, “Your presence here will raise awareness of millions and will create a network of solidarity.” “Dams are blocking natural flow of life” and he noted, “For investment to be true, it has to take human, environmental, social and cultural heritage at its center.” Speaking about the peace process he added, “The process at the moment is described as a ceasefire, it does not mean is a lasting peace. We need to guarantee under the constitution cultural and language rights. For a lasting peace, all groups should be given cultural and religious freedoms…Governments have to change policies towards nature, as long as forests are developed and rivers are dammed, it is not sustainable.” When I mentioned the Save the Tigris Campaign and civil society efforts in Iraq to increase awareness about the impact of upstream dams on Iraqi water resources, he was very happy. He mentioned that his city has started a pilot project of a waste treatment plant, to process the water before returning it back in the river, because it belongs to all the people living along the river. He encouraged cooperation through a recently launched initiative called “United Cities Local Governments,” which Diyarbakir is already a member, we could invite cities that lie along the river to develop stronger cooperation in projects. This could be an opportunity to work together towards solutions to the water issue. Later we moved to a square in the city for the showing of the Damocracy documentary. 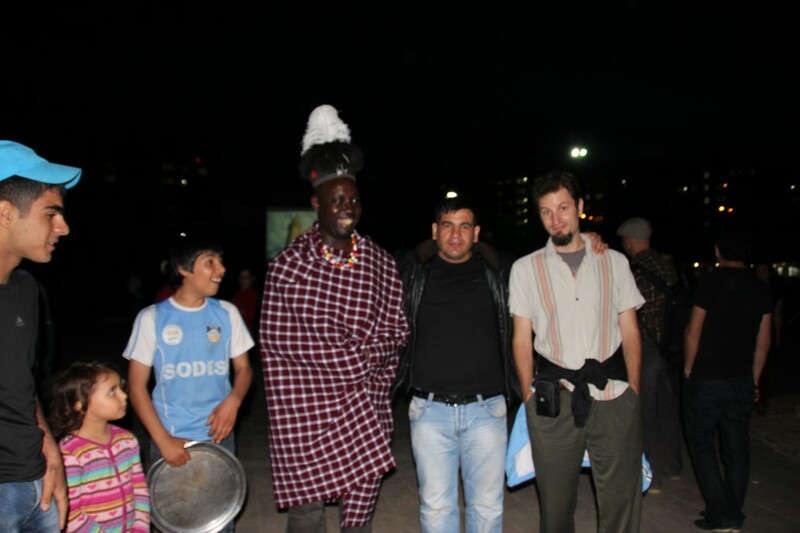 A lot of young people were there, especially curious about Joshua’s-the Turkana community leader- clothes and hat. The image was powerful; a gathering of people from all over the world coming together to protect one of the rivers that gave birth to civilization; the Tigris River, separated by geography, language and culture, yet united in one voice, the voice of the river! 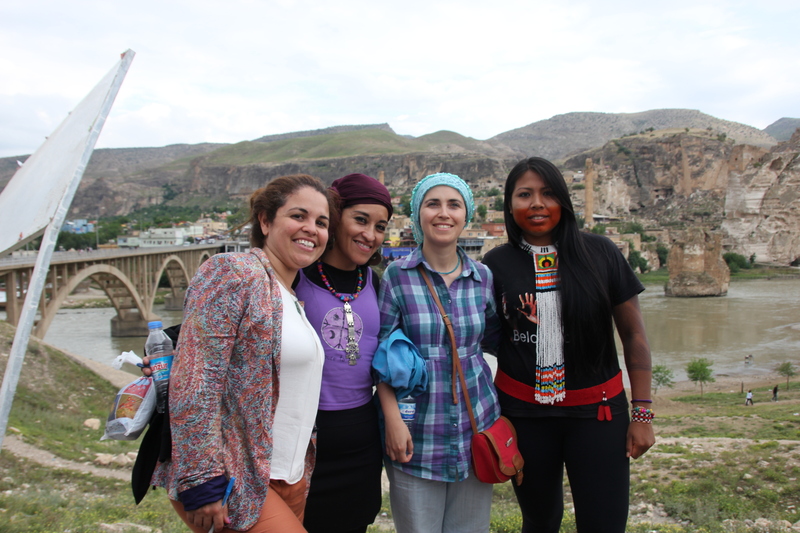 When the delegation reached Hasankeyf after the protest, it was received with traditional music from Mesopotamia. We all walked towards the citadel, with music and displaying our message of rivers unite, and dams divide. Moira, the mapuche leader offered a traditional song from her people as a gift to the people of Hasankeyf. After the long day, we were sitting in one of the cafes overlooking the Tigris River. Chief Megaron was next to me and I was just thinking about the big responsibility of this man to protect his community. They are around 6,000 people. I was talking to him in spanish and he was talking back in Portuguese. I pulled out my computer, and despite we were both tired, I tried to explain the issue of salty water coming into the river in Basra, I showed him several maps, trying to convey the message, showing the confluence of the Tigris and Euphrates in the Shatt al Arab. He got it. In the meantime, Moira went into the river, to listen to it, something that is common in the mapuche culture; people talk and listen to the river. She came saddened and her eyes watering. She said the river is strong, it will survive, but what humanity is doing to its rivers is horrible. It gives me a lot of energy when I meet people like Moira, Joshua, Chief Megaron, and Dicle, doing what it takes to protect water, and protect life itself. This more than a meeting was a peoples gathering, giving, and sharing. We shared music, our connection to water, our struggle, and our solidarity. Why do governments insist on solutions that are not lasting, not sustainable? Dams displace, destroy community ties, and biodiversity, and are NOT a form of clean energy. Dams life span is 70-100 years, and for that we want to kill thousands of years of civilization. The Tigris is the place where civilization itself started, with the Sumerians. Are we willing to give it away to be dammed and destroyed? Is this the form of development that we want? When a river dies, the spirit of its people die.